It is unclear when Saundby Cheese Factory first went into production but it was operating during the 1940s onwards. It was originally founded by William Barton, a local farmer who found a use for the excess milk that was available when the school canteens were closed. The factory consisted of a main production area, cheese store, office and canteen with storage of "maturing" cheeses at The Mill at Morton, The Stables at Wiseton and Grove House, Saundby. The main cheese production area was located on Marsh Lane, Saundby. In the late 1950s Northern Dairy Company took overand it became Saundby Dairy Company (Northern) Ltd. This was a large company that not only specialised in various cheeses, but also other dairy produce. The cheese they predominantly produced at the time was Cheshire Cheese rounds of approximate 56lb in weight (25kg), both red and white, which were delivered countrywide - including Cheshire! At the National Dairy Show held once a year in London, Saundby Cheese was highly regarded and was regularly presented with first prize. At the height of production the factory operated 24 hours a day and employed over 50 people. Some of the employees were from Gainsborough and had already worked all day at Marshall’s Yard. They would then cross the river to Saundby and work a late shift from about 10pm onwards. One of the Cheese Makers at the time was a Ukranian (Bill Federshuk), and a driver during both the Barton’s days and Northern Dairies was Sid Curtis who lived in the one of the Barton’s owned cottages down Marsh Lane. Today, the son of Sid Curtis (of the same name) still lives in the same house. Another driver, Doug Walker lived in one of the cottages before moving up to High House when Northern Dairies bought Saundby Dairy from Barton’s. Mick Crawford’s mother, Edith, worked in the "Binding Department" where each cheese after it had been pressed, was wrapped tightly in gauze wrapping prior to it being put into storage. Madge Fletcher (an office worker from 1960 to 1964) who lived at The Gables, Saundby now lives in Beckingham and Yvonne White, another office worker, still lives locally. 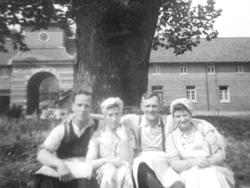 Mrs Fletcher recalls when in the early 1960s a group of Romanians came to visit with especial interest in the purification plant that was installed to eliminate the excess whey. At one time the excess whey was piped underground to large tanks that were periodically emptied and transported to local pig farms for pigswill. Towards the end of the Cheese Factory days the cheese was produced in block form (as opposed to the large round Cheshires) until its closure some time in the late 60s (exact year unknown). The original buildings still remain today albeit weather beaten and dilapidated and it is difficult to imagine the thriving business that once existed. To view more photos click here.